Hard though it might be to believe, back in the ancient days of 2010 the idea of a contemporary haunted house movie felt fresh. Having finally extinguished their Saw franchise, Aussie genre specialists James Wan and Leigh Whannell decided to leave gore horror behind for a classically constructed haunting romp with oodles of Poltergeist influences. The pubic was ready to shriek at things that go bump in the night again and the flick was a success. The duo followed that up with a nutso Italian horror influenced sequel and now Whannell has dipped back into the Insidious well one more time solo (Wan was off orchestrating the automotive insanity of Furious 7). 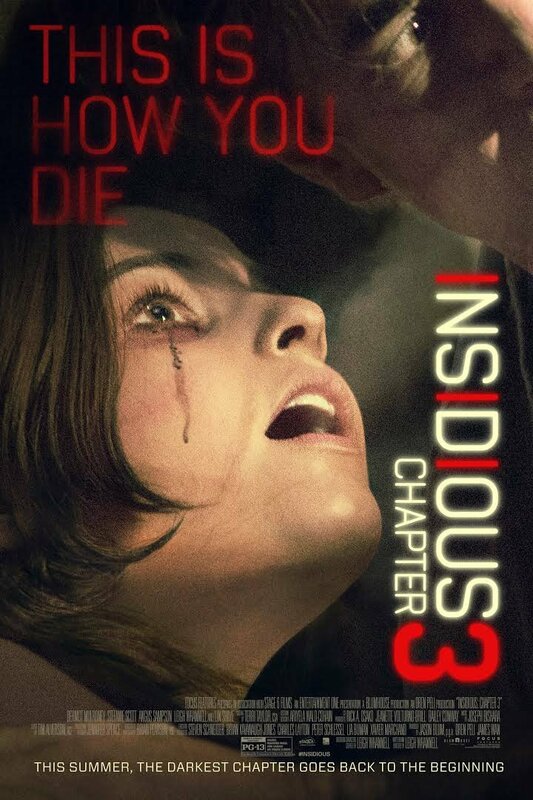 Like both of the previous entries in the series, Insidious: Chapter 3 is far from perfect, but it’s a perfectly serviceable jump scare factory for those in the mood for some safe frights. With the Lambert family now thoroughly over their personalized haunting, Whannell decided to go the prequel route for his second Insidious follow up. The reason is pretty simple. The only franchise characters he was interested in keeping around were Lin Shaye’s loving psychic and her two bumbling comic relief assistants (Angus Sampson, and Whannell himself). Given that Shaye died in the first flick, continuing the story would be tricky to say the least, so turning back the clock was the natural way to go. 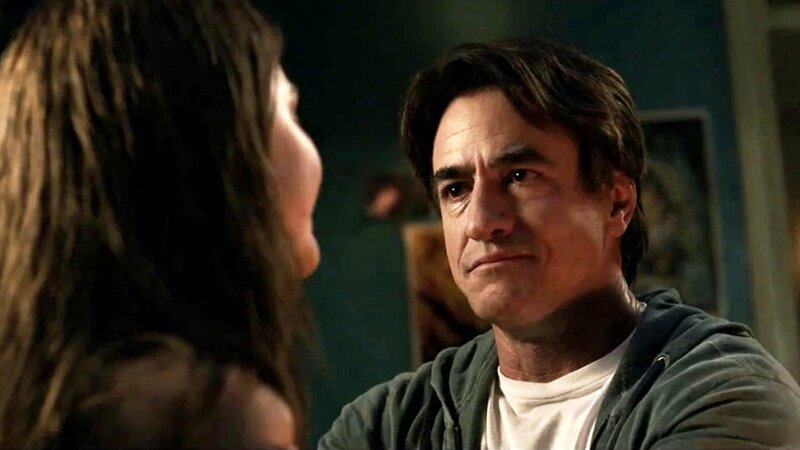 At first, things are a little tedious as a new family is set up with troubled teen Stephanie Scott, her struggling single dad (Dermot Mulroney), and her annoying brother (Tate Berney). The family drama feels purely perfunctory, but then Scott starts getting her own personalized haunting that only she can see and things rev up. Desperate for help, she seeks out local shut-in psychic Shaye and ghost hunter web series nincompoops Sampson/Whannell, who prove to be surprisingly effective as a team. You know, in that “I think this is the beginning of a beautiful friendship” kind of way. As a writer, Whannell’s gift has never been naturalistic human drama. The first act of Insidious: Chapter 3 sags pretty heavily under the weight of the writer struggling to set up the family dynamics necessary for his domestic haunting pay offs. But thankfully just as things start to get a little too Degrassi-ish, the set pieces arrive. Whannell had some pretty big shoes to fill by replacing his long-time director partner James Wan. The Conjuring director might have his weaknesses, but Wan’s manic modern approach to jump scare horror certainly isn’t one of them. Fortunately, Whannell doesn’t try to copy Wan, instead going for his own more simplified, yet effective style of supernatural suspense horror. He delivers some big moments (trapping the protagonist in a pair of leg casts and a wheelchair was a good choice, especially during a nauseatingly sound-effect driven broken leg walk) and he delivers some delightfully gross ghost designs that are arguably the best in the series to date. Insidious: Chapter 3 at least comes through in the scare department and honestly, that’s what you’re showing up for anyways. Don’t pretend otherwise, people. While the central family in this prequel might be a bit dull, the returning franchise favorites give the audience some characters to cling to. In particular, long time character actress Lin Shaye (best known for the disgusting characters she plays in Farrelly Brothers comedies like Kingpin and There’s Something About Mary) steps up to central role and delivers a broken woman who finds salvation in psychic ghostbusting. She’s a delight, carrying the dramatic weight of the film, while the hit and miss character comedy of her geeky ghost hunter collaborators Sampson and Whannell offer charming support. This gang is an undeniably amusing haunting hunter team and if this franchise goes on any further, it would be in good hands with this trio at the center provided that less screen time is given to their clients. Insidious: Chapter 3 is never going to be remembered as a new genre classic, but it’s better than most horror threequels or prequels and gets it’s jittery jumpy job done with little fuss and even less muss. If you’re hankering for ghostly jump scare horror this weekend, you could definitely do worse. Insidious: Chapter 3 at least comes through in the scare department and honestly, that’s what you’re showing up for anyways. Don’t pretend otherwise, people.